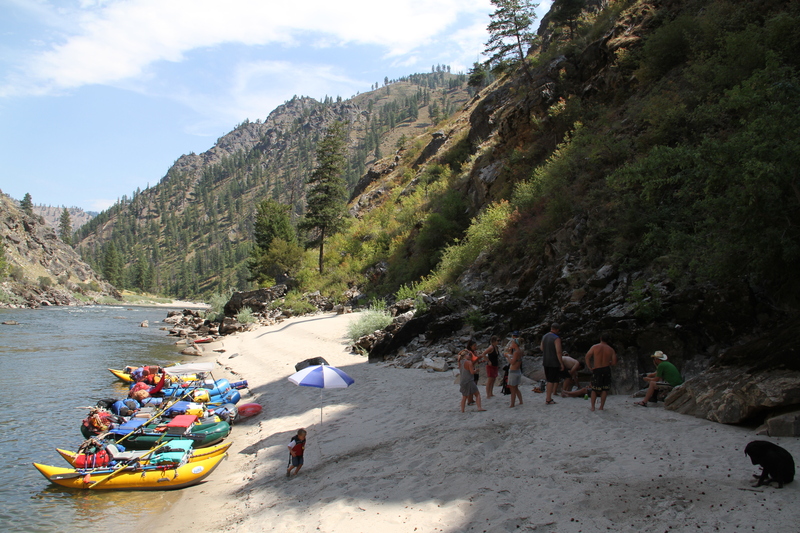 One of the trips we look forward to the most each summer is a multi-day raft trip. Sometimes we’re lucky enough to pull a permit for an elusive stretch of water, but non-permitted stretches can be just as fun. This year one of our friends pulled what’s been dubbed “The white-water equivalent of Willy Wonka’s Golden Ticket:” the Middle Fork of the Salmon. So on July 12th, twelve of our closest friends embarked on the 7 day journey. 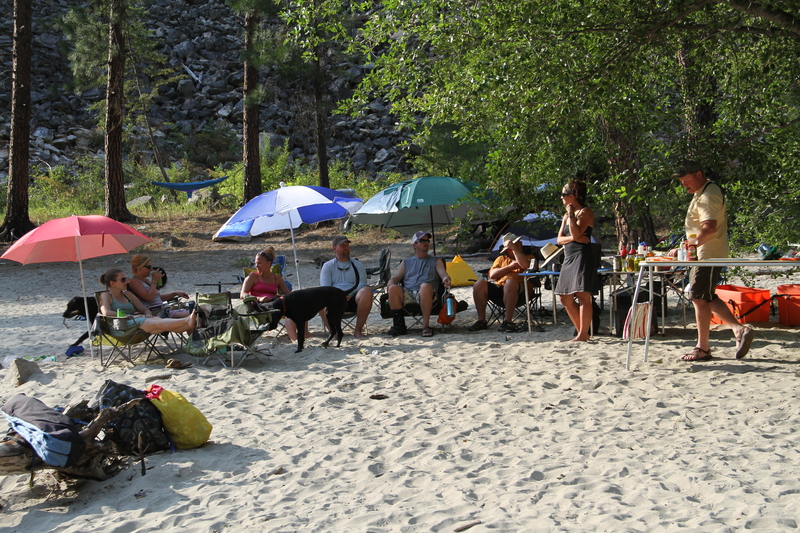 Several of us had been down this particular stretch of river before, but it was new to almost half of the group. Nevertheless, the group was an experienced and well-seasoned team of multi-day rafters and I took note that not once was I uncomfortable during my 7 day trip. I mean, we’re talking seven days of rafting, camping, baking in 100 degree weather during the day and sleeping in dirt and/or sand at night. And I started taking stock of some of the completely unnecessary yet oh-so-nice-to-have items that people brought. You’d be surprised at what you can fit in a 14 foot boat, and what people will make room for just to make the trip a little bit more enjoyable. I mean, we’re not eating oatmeal and sleeping in 2-person tents. I usually come home with a few extra pounds because we eat so well (although, note that Eric says that life in the front of the boat is a little more relaxed than on the oars. I’d have to agree). 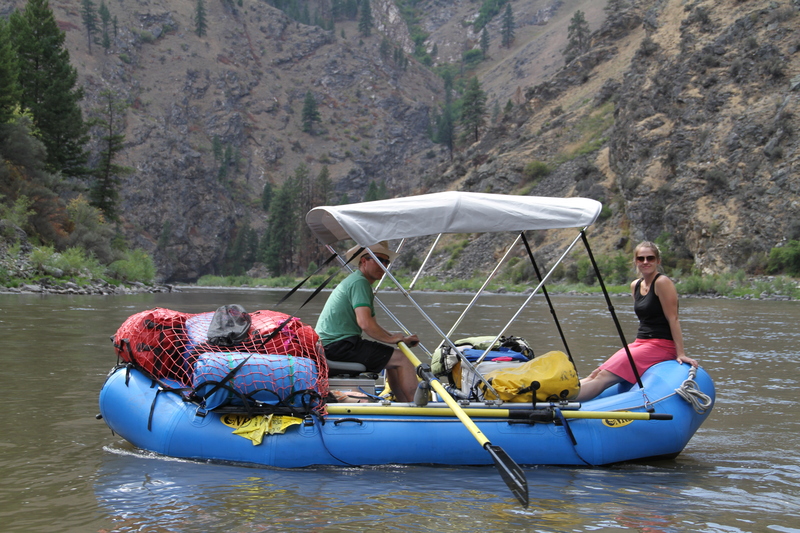 So after seven days of research, here are the luxury items I noticed (luxury because they are really, truly unnecessary in the whole scheme of things) that if brought, will take your next multi-day float trip to the next level. Solar Shower – After four days in intense heat, you’re going to stink. I don’t care who you are. These solar showers have been a great addition to our gear and are perfect for a layover day. No clue who this is. But the picture is awesome. 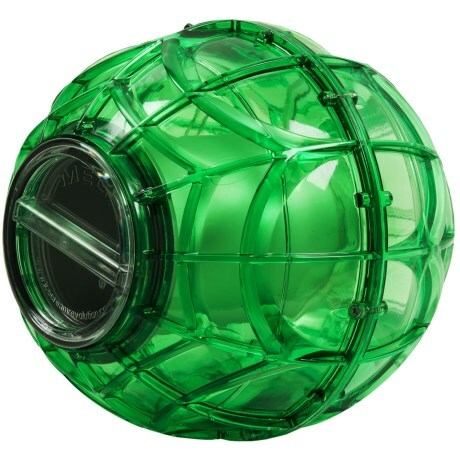 Bee traps – All it takes is one bad bee trip and you will never regret bringing one. Our last trip down the Main Salmon was infested with bees; to the point that you couldn’t sit down to eat. You can always make your own trap at camp, but I found having a portable one to move from camp-to-camp was quite the luxury. Clothes pins – Simple but life-saving. Clip your wet swimsuit to your tent pole and don’t worry about it blowing away. Clip the kitchen towel to the table. Pull your hair back. Kill a bee. Really the options are endless here and they have saved my hinny several times on the river. Side Table – This little green side table has been the topic of debate for two years now. Completely unnecessary or necessary evil? The jury is still out, but let’s just say that no one complains when they’re sitting next to it. 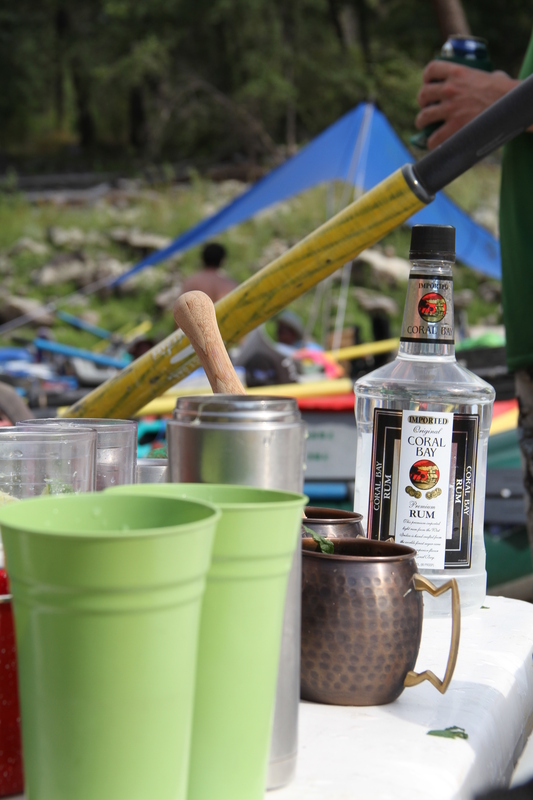 Cocktail Ice – because when it’s 100 degrees and your 40 miles into the wilderness….ice tastes amazing, and almost sinful. Because shouldn’t you really be putting that ice in your food cooler? One of our boats had an entire cooler dedicated to cocktail ice this year. Extreme? Perhaps. Glorious? Yes. Sand mat – Two years ago Eric bought me this sand mat for my birthday. You may think it’s a weird gift, and I suppose it kind of is. 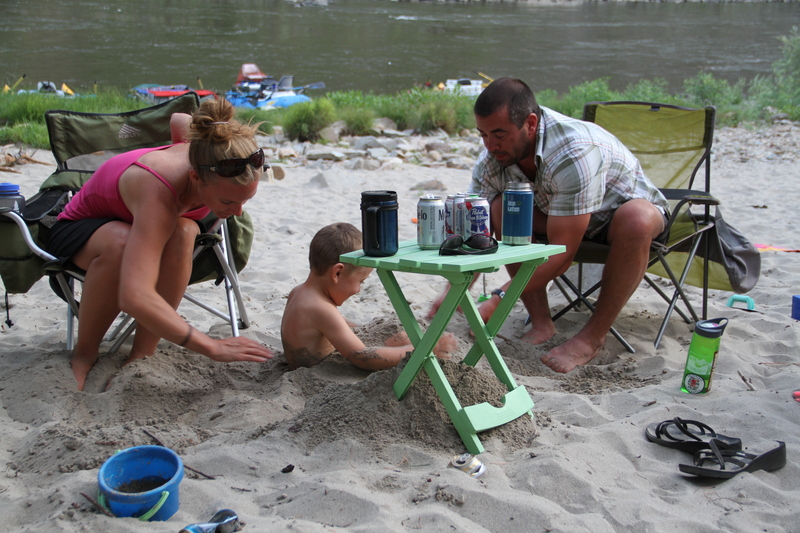 But one of my biggest pet peeves is sand or dirt in our tent. And a river trip is usually ripe with sand. These mats are amazing – any sand that lands on top gently shifts through the material and back out to the beach. It doesn’t pile on top of the mat and get tracked into tents, stuck on sweaty skin, etc. We use this as a tent footprint or just to sit on at the beach. It was a great gift! Ice cream maker – I’m convinced that modern conveniences are appreciated ten fold once you get off the river. Same goes for anything cold. Our friends have brought their ice cream ball on a few trips and every time they do it’s a hit. Something about getting to have ice cream in the wilderness (that you made!) is a treat. Umbrella or Bimini – Again, a lifesaver on a hot day. We used to never bring shade on the boat until I got pregnant and (rightfully) demanded it. We tried an umbrella for a year and found that it doesn’t always work that great, so we invested in a bimini the following year. We figured with kids it would be nice to have guaranteed shade, especially when we want to start bringing them on multi-days with us. I really like the bimini, but most of our crew still roll with umbrellas. Which is great because they double as shade for camp or lounging in the water on a hot day. There have been many an afternoon sitting on our chairs in the water huddled under umbrellas. I never regret having one on board. Are these staples in any of your boats? Or do you tend to travel light? Perhaps you bring something that we need to know about! If so, please share! Some good ones in here. Here’s one I discovered. I started using some of those cheap solar light spikes around camp. They work as a great substitute for stakes at the front of the tent vestibule for those nights you could use a well lit landing strip. Ah….great idea Tony! I love it and will write it in my river journal to remember for next time.